An 8-page exhibition catalogue has been produced by graphic designer, Nicole Lim with editorial support from Luisa Tora. Featuring artist statements, bio information, photos, letters to the editor, features and sponsors. I write to congratulate the women who have once again stepped out of comfort zones to jerk people’s attention back to the realities of Fiji’s political landscape through an art exhibition. I am fortunate to count myself amongst those who were part of the passionate evening the inaugural VASU was and I have no doubt that Fiji Times will be another delicious feast, which I shall be a part of, in spirit. In solidarity from the wet southern downs of England. i hrd there’s sum yalewa siosio ovr in niusiladi been usin the tittle of your estimated niusipepa as tha tittle of one art expedition. i ask you: is their nothing sacred? fiji times, man: you bin round a long time. longer than these grls bn wearin knows rings and things in there tongues. and chumaring othr girlz. and som boyz too. tongan ones sumetimes. oilei. au sa madua sara. 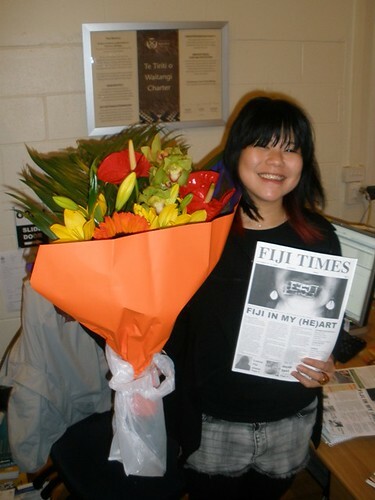 they spoiling yr good nam, and our good name 2. fiji times is the nme of a nuspepa. not one art expedition. you bin copyright your name oready? i hop so. 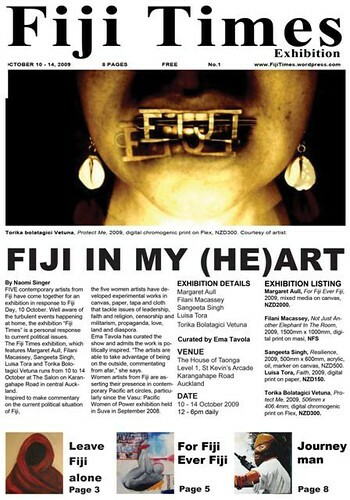 On behalf of the Fiji Women’s Rights Movement, I congratulate the artists who are part of the” Fiji Times” exhibition. As an organisation that passionately upholds and promotes the rule of law, democracy and human rights, we believe that any space where women can come together to expose and voice their outrage at the current political, social and economic problems in Fiji – should be strongly encouraged and supported. FWRM was a supporter of last year’s “Vasu – Women of Power “exhibition in Fiji so we know that art is and can be a vehicle for social, political and economic transformation. Unfortunately we cannot be there to be part of this important exhibition. However please know that we are there in solidarity. Thank you for being our voice! We salute your courage and passion and wish you all the success. The Fiji Times newspaper is 140 years old. Fiji time, they say, is a little slower than elsewhere. For some it is time to move on because Fiji times are a-changin’. But wherever we are, we still have time for each other. VINAKA VAKALEVU to all those who contributed to this project, from Suva to Sussex, England and Wellington, New Zealand. Thank you so much – your support means so much to us. The exhibition catalogue couldn’t have happened without the patience and amazing graphic-designer-survivor skills of Nicole Lim! Thank you Nicole, you are a STAR!